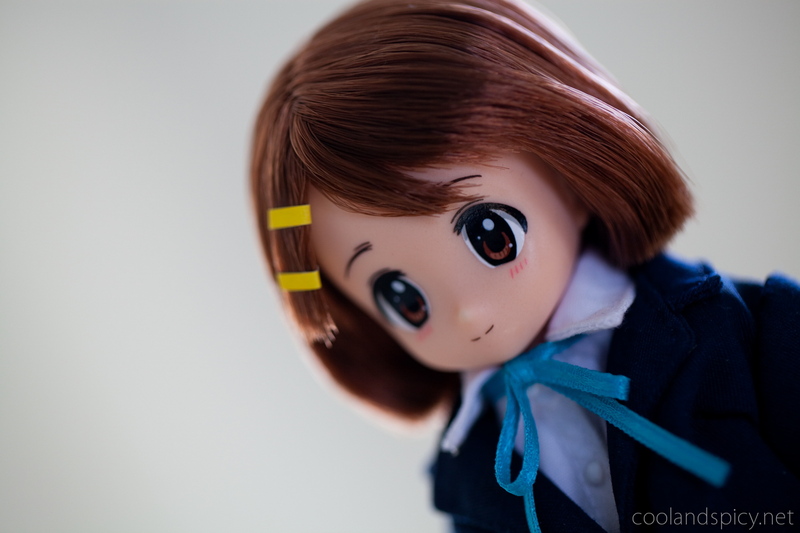 Cool and Spicy » Introducing Yui Hirasawa by Azone International! After discovering the irresistible Hiiragi Kagami by Mama Chapp, it was inevitable that more dolls would follow. 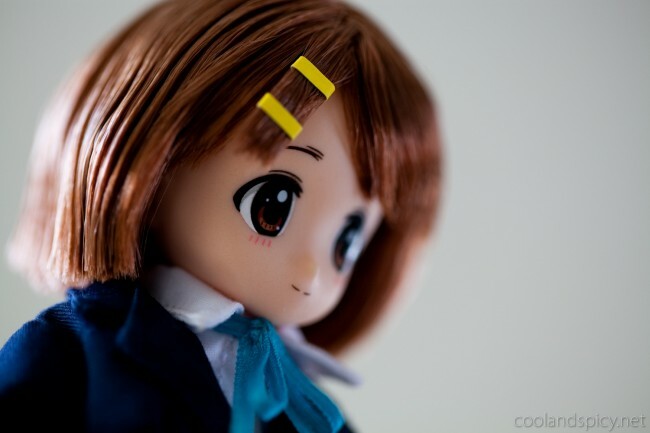 Today, Hirasawa Yui joins the family ^^. Yui even came with her favorite guitar/friend, Giita! 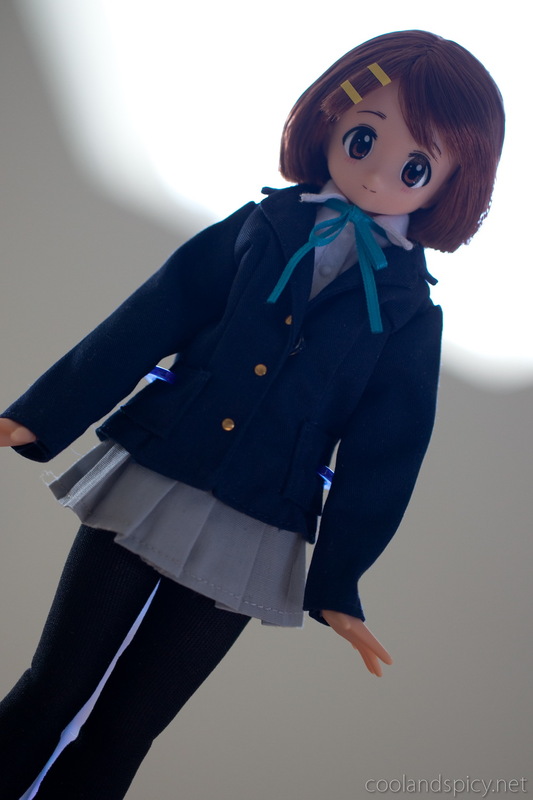 Yui comes dressed in her full school uniform with blazer, shirt, blue ribbon, and pleated skirt. One thing she did not come with is her distinctive yellow hairpins. Well, Azone included a piece of paper along with a strip of double-sided tape that was supposed to be used to cut out thin strips of yellow paper to serve as hairpins These hairpins would then have to be wrapped around a lock of hair. The problem, however, was that the tape really didn’t stick well and Azone only included a small amount of yellow paper that could be cut into hairpins. After 30+ minutes of trying to wrap the tiny yellow pieces of paper into hairpins, I got frustrated and just made my own out of some yellow sticker labels (of which I had a near endless supply of). So, what if it’s summer and Yui is getting a bit hot with her blue school blazer? Well, you can take off her jacket, of course! 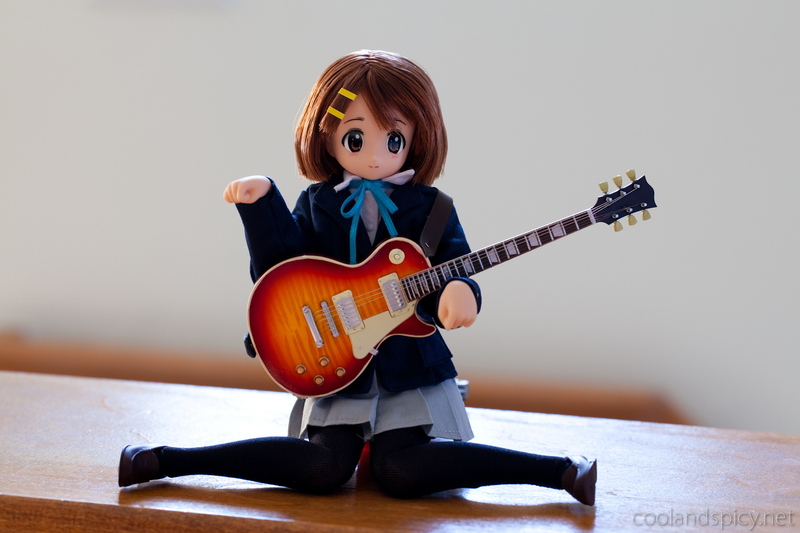 Or, if it’s more to your style, Yui can don her school sweater (or is it a vest? I don’t know these things…). Even more clothing extras! The final accessory is Yui’s Honeymoon (ハネムーン) T-shirt. Why “honeymoon”? I honestly don’t know. I don’t remember this specific shirt from the anime, but Yui wore a lot of strange shirts so I probably just missed it >_<. I think there were also some other special editions of Yui from Amazon and another store that had a different shirt in place of this one. Amazon had one that said “Paradise” but looked pretty similar otherwise. Ordering from Amazon would have been more expensive so I just got the regular version with the Honeymoon shirt ^^. Update: Yui’s body is the Pure Neemo Flection. 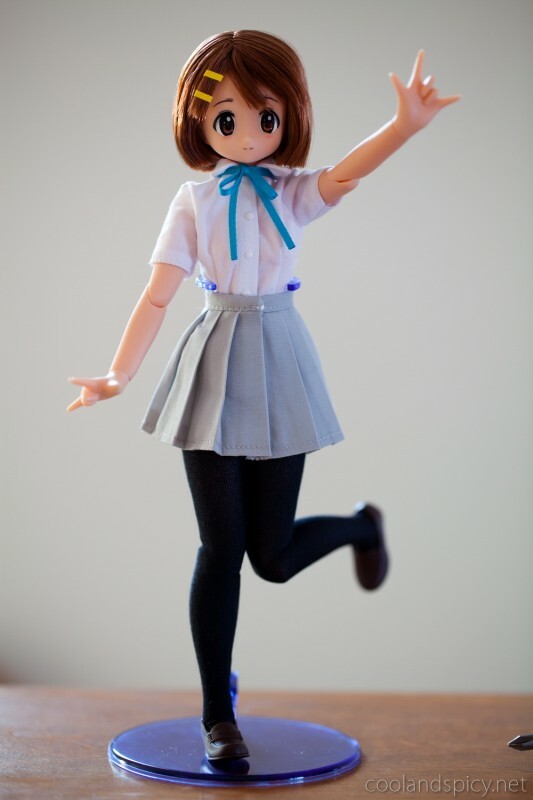 Anyway, the end result seems to be that Kagami is more flexible and easier to pose. 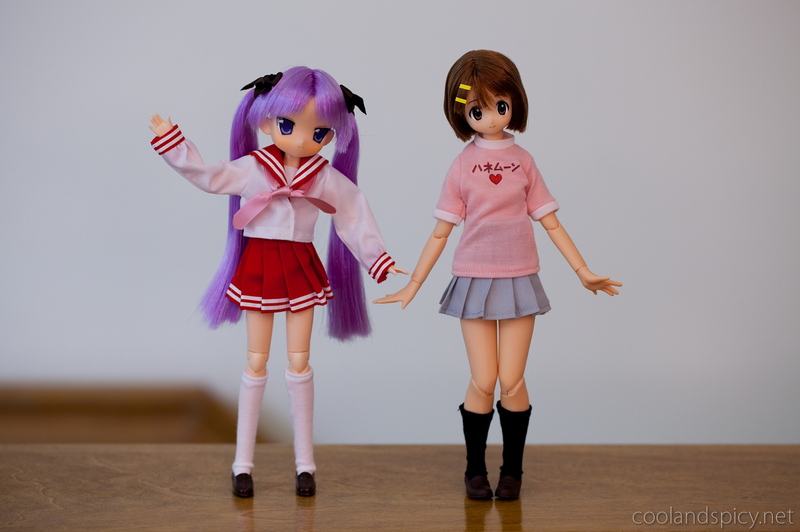 For example, Kagami’s legs and knees are able to rotate farther and her arms and hands have more movement range. Overall, Kagami is more flexible. 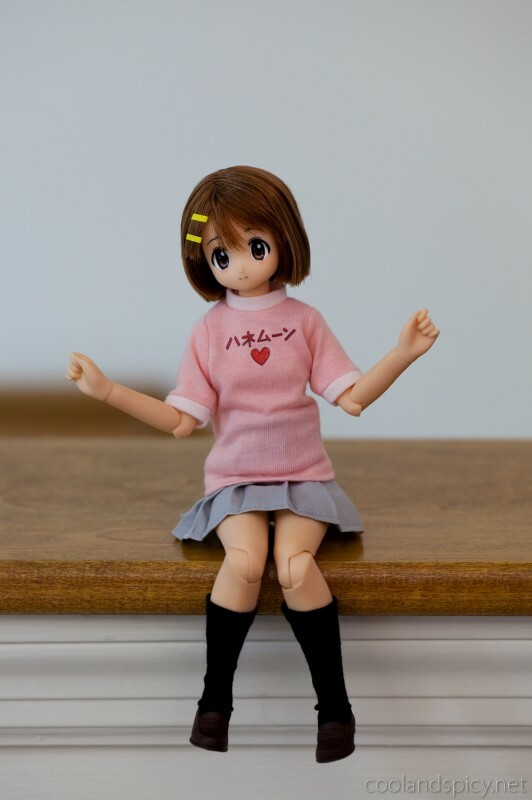 The advantage Yui’s slightly less flexible body has is that it looks better ^^; The joints aren’t so obvious and her body is just shaped more naturally. 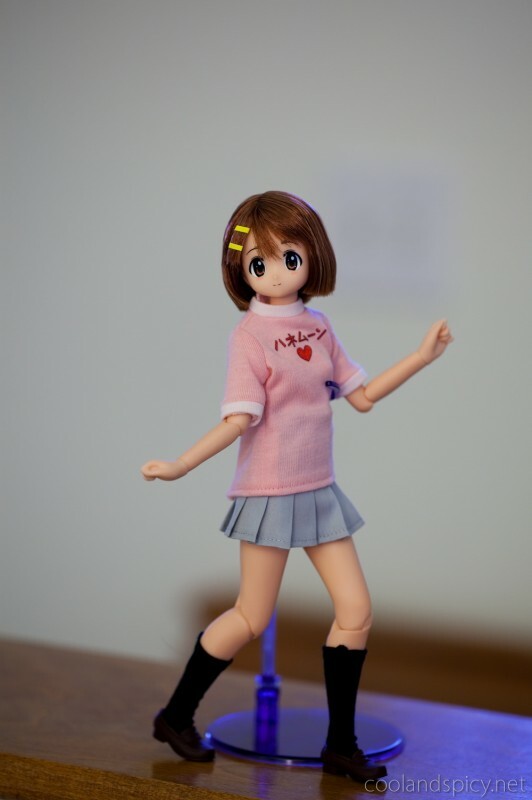 Yui has a much harder time standing without external support. Different shoes may help this though. Lastly, and Yui wins here hands down, is the clothing. Yui’s school uniform is very high quality and fits nice and snug whereas Kagami’s school uniform looks overly large and stiff in comparison. I really, really like the 3 (partial) outfits that come with Yui. Definitely a huge plus for me! So, the final verdict? 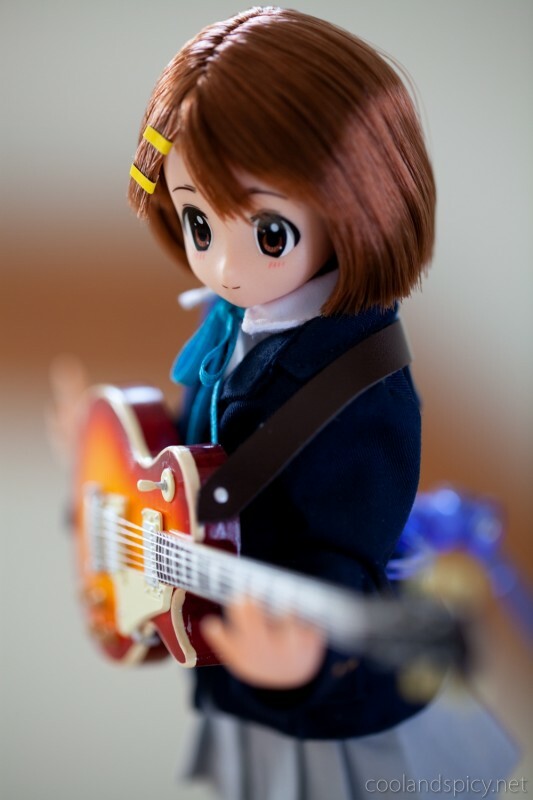 I love Yui! 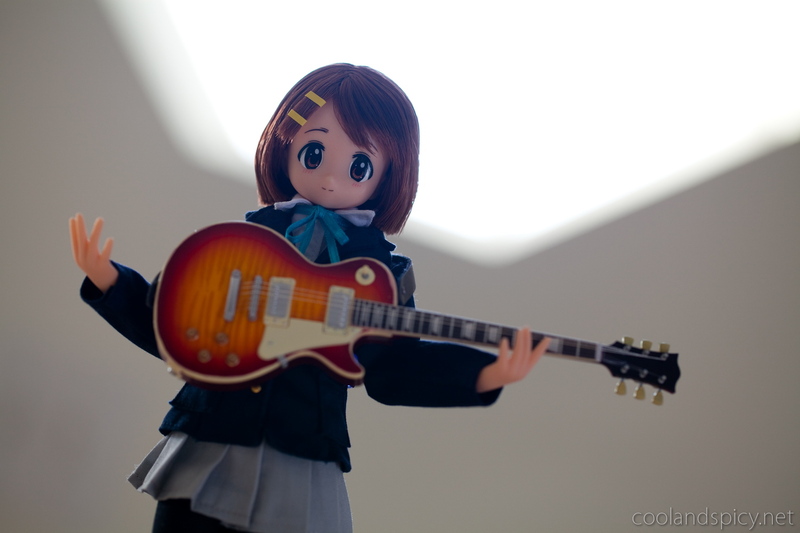 Parting shot of Yui rocking out with Giita! Yui is sooo cute! The last pic is my favorite. 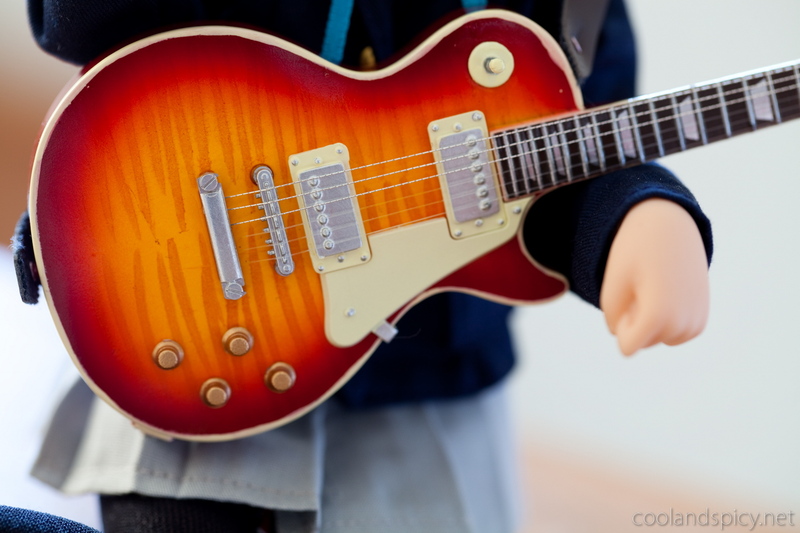 ^^ I hope to own one of these dolls too. 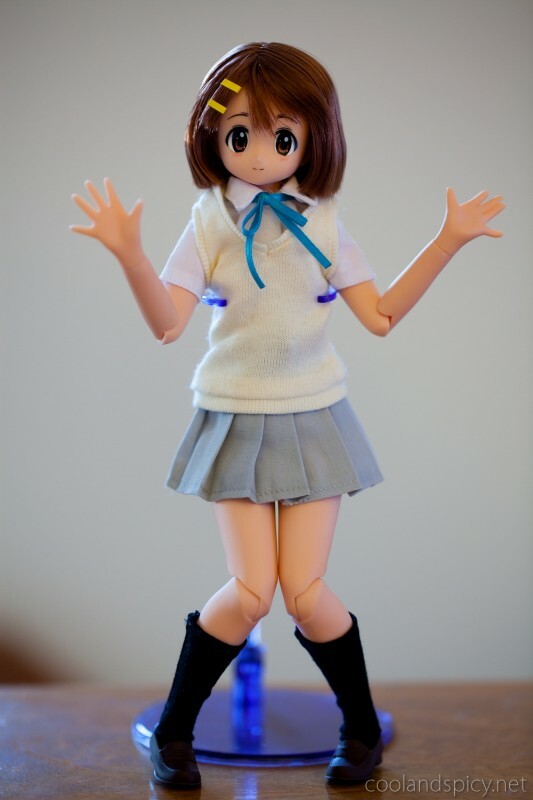 Saw the Mio doll and she’s very cute as well. .-= Xine´s last blog ..Black Rock Shooter is here! =-. 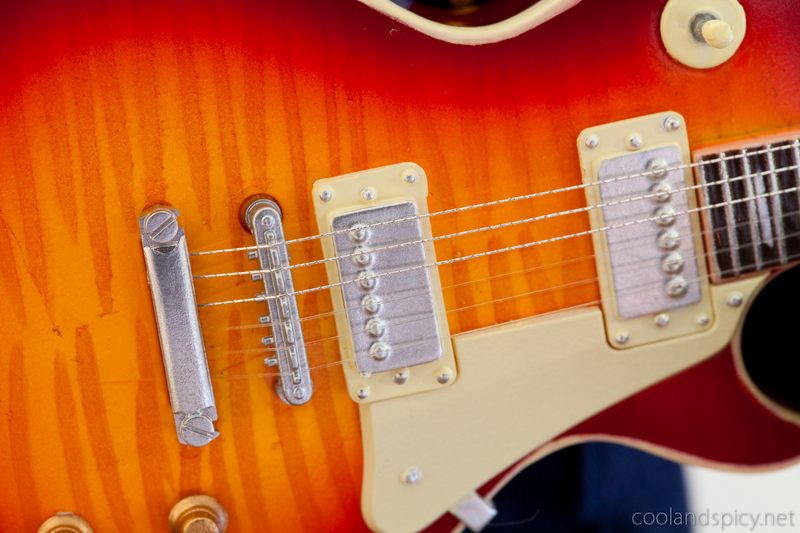 .-= Smithy´s last blog ..So-Ra-No-Wo-To 2 =-. 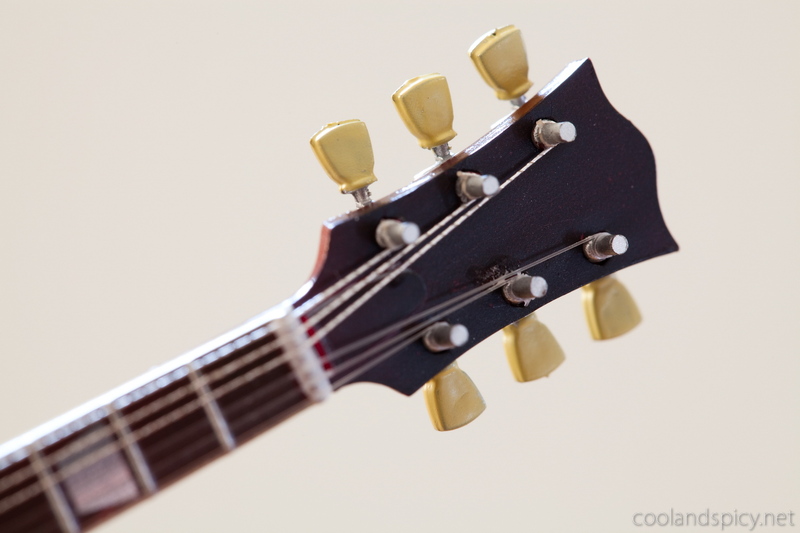 .-= Optic´s last blog ..Nana Mizuki Live Diamond x Fever and Yui Horie Clips 2 =-. Hehe, yes, another doll. To be fair, I’ve had Kagami since around September. I just delayed in posting about her ^^. 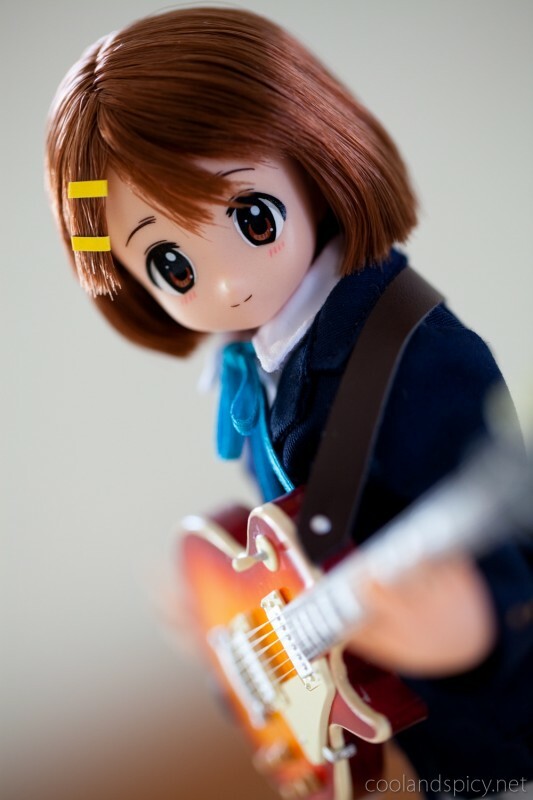 But Yui is pretty cute. .-= mefloraine´s last post… Nusunde Lilith / 盗んで♥リ・リ・ス =-. You need to show her chin some more. When animals want to fend off attackers they hide their necks, and that way their heads, and thus their bodies appear bigger. For people, it just makes their heads appear too big for their bodies, heh. .-= Guy´s last post… Music: The Guild – Do You Wanna Date My Avatar? =-. Eh? Big heads are part of anime! Well, Kagami does appear to have a somewhat over-sized head, but like I mentioned, they gave her a more anime-ish look overall. .-= Ningyo´s last post… Some Things Are Never Meant To Be Said =-. Seems Mio is getting nekomimi instead of honeymoon T-hirt and socks/stockings. What stand are you using for her? It’s sold out a few times before. They will probably get more of them sometime.